Kevin Price, Editor at Large for USA Business Radio, has long been an advocate of New Rich approaches to better and more profitable living. Recently, USABR took a look at his forthcoming book — Making “New Rich” Books Work for You — on why such literature has not worked for the vast majority of those who have read such books and how his book is different. His book points out the real reason “Rags to Riches” is not so easy, and offers hacks how to make these books actually work. He finds the “missing link” in New Rich literature. Before we discuss Kevin Price’s new book, one should first look at the expression, “New Rich.” The expression was coined by Tim Ferriss, the author of the bestselling book The Four Hour Work Week. Over a million copies have been sold since its release in 2007. It has received both enormous praise and tremendous scorn. Ferriss says, “The New Rich (NR) are those who abandon the deferred-life plan and create luxury lifestyles in the present using the currency of the New Rich: time and mobility.” The objective is to create a lifestyle that empowers people to enjoy maximum freedom as well as a high income, and do it today. Learn more about Tim Ferriss and his work here. 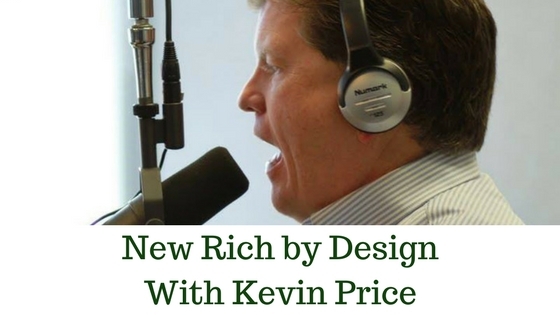 The first thing you learn about Kevin Price is that he is a big fan of “New Rich” books. He has read most of the major ones and is friends with some of the icons of the New Rich movement. including Robert Kiyosaki, author of Rich Dad Poor Dad. “I am a huge believer in the value of these books,” says Price.